Getting Comfortable with being Uncomfortable! Join us for a fun and light-hearted night of networking, storytelling, laughter and learning. Develop your confidence, enhance your communication skills, boost your creativity, step outside your comfort zone and build new connections with the awesome business women of the Pilbara region! We are delighted to be bringing back the enigmatic pocket-rocket that is Jordana Borensztajn, who last year wow’ed us all with her energy, passion and humour. We can’t wait to see what Jordana will bring to the event this year! This event is sponsored by the Australian Government through the Department of Infrastructure and Regional Development and Cities Building Better Regions Grant. I had the most wonderful time in the Pilbara! Thank you so much for your help and your hospitality. It was an incredible experience. Thanks for allowing me to contribute to After 5 in such a positive and uplifting way. 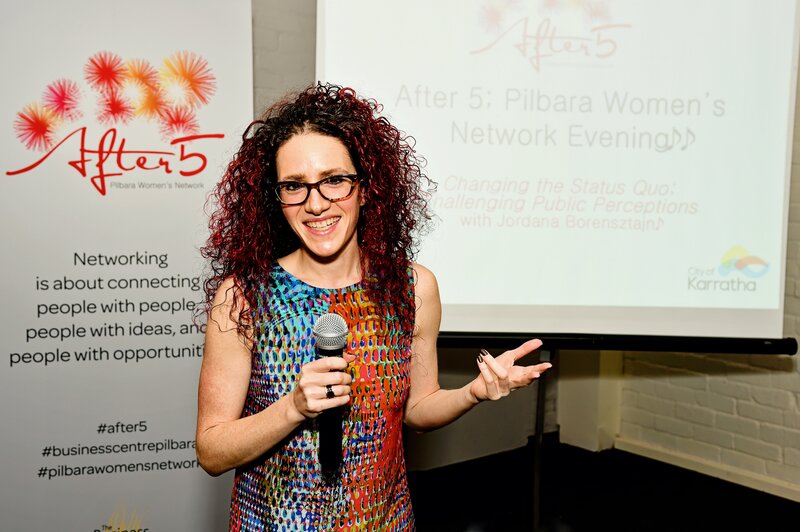 The energy was high, there was lots of laughter and everyone was so engaged and involved – what a fabulous group of women at After 5. I absolutely loved being involved. Thanks again for choosing me to be part of your event. I really enjoyed working with you, had an absolute blast and enjoyed travelling to a new destination and getting to know Karratha! Proudly supported by Building Better Regions and the City of Karratha.